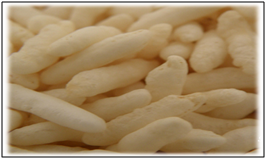 Puffed rice is created by treating rice in the presence of steam under high temperature and pressure. Many foods have to be preceded by a mixing process in order to achieve characteristics that are important for the final product such as texture, homogeneity, composition and temperature. Mixing can start as early as the preparation of ingredients and can be continuously used until the end of the process. It has been one of the most used steps for food preparation for a long time. Even if it is a very basic step it has not been understood in its totality because of its wide variety of uses. Food mixing can go from nano-emulsions to large particle suspensions, highly viscous pastes to dry powders with or without the incorporation of gas. The major parts of food mixing that are covered are: the basic objective of mixing (homogeneity), the types of equipments used for mixing, solids as well as fluids, and the mixing power correlations. The prime objective of mixing is to have homogeneity (uniform distribution) in the product. Usually, the homogenization involves the reduction of particle size achieved by the action of shearing forces. Homogenization is applied very frequently in the food industry such as the processing of fluid milk, emulsification of salad dressing and sauces, mashing of infant food, stabilization of concentrates, etc. Different products require different goals, for example, creams and margarines have to disperse one liquid phase in another forming a stable emulsion; ice creams and chocolate should incorporate gas bubbles as an ingredient into liquid or viscoelastic materials, but for sauces and salad dressings bubble incorporation is undesirable. The ingredients being mixed directly influence the equipment type that should be used depending on the mixing scenario (solid-solid mixing [powders or textural effects], solid-liquid mixing [coffee, sugar] or liquid-solid mixing [butters, pastes and dough], liquid-liquid mixing [emulsions: margarines and spreads] and gas-liquid mixing [fermentation or chlorination]). It is important to consider a balance between the equipment and ingredients properties in order to obtain an effective size of production without using a large quantity of time and energy consumption, this would relapse in a better process and energy efficiency. Another important parameter for sizing the equipment is the rheology. In the food industry hygienic design and suitability of cleaning are very important issues to consider because of the consequences that could result from a poor hygienic standard, for example the contamination of the product by microbial growth. For the mixing of fluids some of the most important equipment items used are: the paddle mixer, anchor mixers, turbine mixers (different impellers), propeller mixers and the new generation of static mixers.